The Broadway Valdez District Specific Plan envisions the district as a “complete” neighborhood that supports socially- and economically-sustainable mixed use development; increases the generation and capture of local sales tax revenue; celebrates the cultural and architectural influences of the neighborhood’s past and present-day prosperity, and implements a “green,” “transit-first” strategy that reduces greenhouse gas emissions and the use of non-renewable resources. The Broadway Valdez Specific Plan was adopted by the City Council at their June 17 and July 1, 2014 meetings, as well as related General Plan Amendments and Design Guidelines, new D-BV Broadway Valdez District Commercial Zone Regulations, Zoning And Height Area Maps, and established new parking in-lieu and open space in-lieu fees. Broadway is viewed as the City’s “Main Street” and is significant due to its proximity to downtown, its location near two BART stations, a major AC transit bus route, as well as its relationship to adjacent residential neighborhoods, the adjacent medical campuses of Kaiser and Summit/Alta Bates, the successful existing Piedmont Avenue retail street, and the edge of Lake Merritt. Oakland has long been the nation's largest underserved Trade Area for comparison goods. Oakland currently exports 75% of its potential sales in this category, or roughly $1 billion in sales every year, to the neighboring communities of Emeryville, San Leandro, San Francisco, and Walnut Creek. While the City has many fine merchants, it lacks many larger retailers and a critical mass of retail selection. This dearth of retail options discourage its residents from shopping locally, which affects Oakland’s tax base that supports road maintenance, clean parks, and functional city services. The approximately 95-acre Broadway Valdez District Area is generally defined as the Broadway corridor between West Grand Avenue and Interstate 580 (approximately 0.8 miles in length) including stretches of 27th and Valdez Streets. 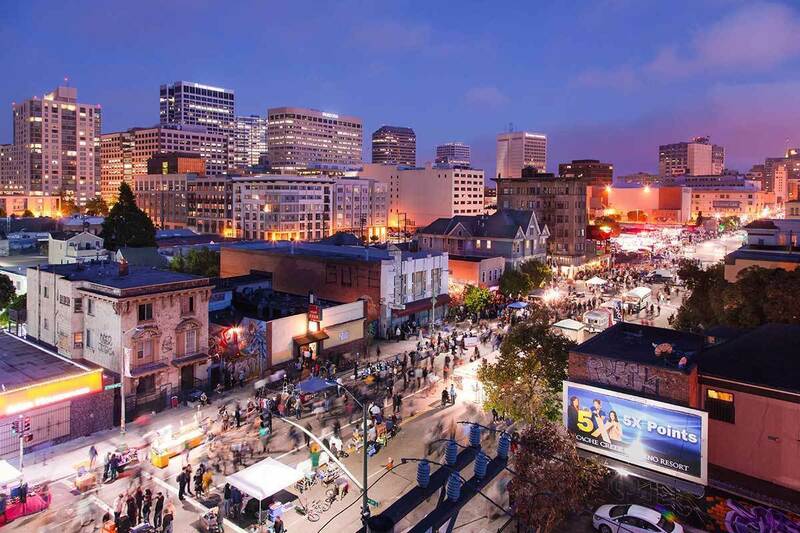 It is situated amid some of Oakland’s most economically robust and burgeoning areas and close to 3 major BART stations. Create an attractive, regional destination for retailers, shoppers, employers and visitors that serves in part the region’s shopping needs and captures sales tax revenue for reinvestment in Oakland. Provide quality jobs, diverse housing opportunities, and a complementary mix of retail, dining, entertainment, and medical uses. Enhance the Plan Area’s social and economic vitality by building upon the area’s existing strengths and successes, and revitalizing and redeveloping underutilized areas. Ensure the neighborhood is well-served by an enhanced and efficient transit system. Encourage the creative reuse of historic buildings that maintains a link to the area’s social, cultural and commercial heritage while accommodating contemporary uses that establish a vibrant and visually distinctive retail and mixed use district. Integrate high quality design of the public and private realms to establish a socially and economically vibrant, and visually and aesthetically distinctive identity for the District. Provide quality pedestrian facilities and amenities that create a safe and aesthetically pleasing environment that supports increased pedestrian activity. Promote walking, biking, and transit while continuing to serve automobile traffic. Carefully manage parking to address retail needs while encouraging walking, bicycling and public transit as preferred modes of transportation. Integrate land use, mobility, and design strategies to minimize environmental impact, reduce resource consumption, and prolong economic and social cohesiveness and viability. Utilize a coordinated implementation strategy that ensures consistent and on-going City support for the Specific Plan vision for the area.